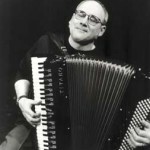 Guy Klucevsek has created a unique repertoire for accordion through his own composing and by commissioning over 50 works from composers including John Zorn, Lois V Vierk, Fred Frith, Alvin Lucier, Mary Ellen Childs, and William Duckworth. His music/theatre pieces include Squeezeplay -- collaborations with Mary Ellen Childs, David Dorfman and Dan Froot, Dan Hurlin, Victoria Marks and Claire Porter -- which The Village Voice called "delicious;" Hard Coal, with The Bloomsburg Theatre Ensemble, Chinoiserie, with Ping Chong and Company,which was featured on the 1995 Next Wave Festival at BAM, and Cirque Lili (2000), with French circus artist Jerome Thomas, a piece which has been performed over 250 times world-wide, always with live music. Solo performances include the Ten Days on the Island and Adelaide Festivals in Australia, the Berlin Jazz Festival, New Music America, Serious Fun! at Lincoln Center, Bang on a Can, Spoleto Festival/USA, and the children’s television show Mr. Rogers’ Neighborhood. He has also performed and/or recorded with Laurie Anderson, Anthony Braxton, Anthony Coleman, Bill Frisell, Fred Frith, Robin Holcomb, the Kronos Quartet, Natalie Merchant, Pauline Oliveros, among many others. Artists who have recorded his compositions include Dave Douglas, Carol Emanuel, Relache, Aki Takahashi, Margaret Leng Tan, and Twisted Tutu. He was an original member of Dave Douglas’s band, Charms of the Night Sky, with whom he recorded three albums and toured throughout North America and Europe. 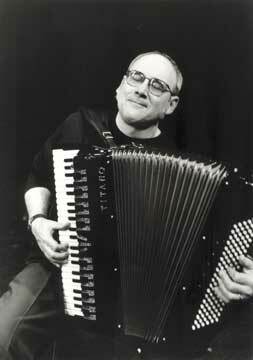 In 1987, Klucevsek commissioned Polka From the Fringe, a collection of 32 post-modern two-steps by such composers as Carl Finch, Fred Frith, Christian Marclay and Elliott Sharp, which he presented at the 1988 Next Wave Festival, and has performed around the world with his group, Ain’t Nothin’ But A Polka Band. In 1996, Klucevsek formed The Accordion Tribe, an international line-up of composer/accordionists Maria Kalaniemi (Finland), Lars Hollmer (Sweden), Bratko Bibic (Slovenia), Otto Lechner (Austria), and Klucevsek (USA). They have released three recordings on the Intuition label, and are the subjects of the Stefan Schwietert documentary film, Accordion Tribe: Music Travels , which was released in theaters across Europe in 2004-2005, and featured at film festivals in North America. Klucevsek has released 20 recordings as soloist/leader, including "Polka Dots & Laser Beams " and "Who Stole the Polka?, " which were chosen as the best recordings of 1992 by John Schaefer on the nationally-syndicated radio program New Sounds, and Transylvanian Softwear, which was cited as a 1995 Recording of Special Merit in Stereo Review. You can also hear him on John Williams's scores for the Steven Spielberg films The Terminal, Indiana Jones and the Kingdom of the Crystal Skull, and Munich. He has performed on Broadway in Fiddler on the Roof, Victor/Victoria and Piaf.